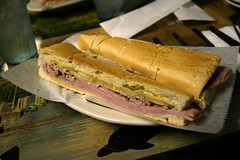 Cuban food has several signature dishes. In addition to the previously discussed Ropa Vieja, plantains, puerco, and such that we had at Latin American Bayside cafe, there’s also the Cuban, a sandwich with both roasted pork and ham served on a Cuban-style French roll (slightly more airy and less crusty than a traditional French baquette), served with cheese and, most importantly, pickle, all pressed and toasted to perfection. Unfortunately, while South Beach used to be a pretty good area for Cuban Sandwiches, most of the Cuban places I used to frequent in the 90s are gone. However, Puerto Sagua is still there, and still good, so while enjoying the sites and sounds of a friday night in South Beach, we stopped by Puerto Sagua for a late-night snack. My Cuban sandwich from Puerto Sagua. One of the better Cuban Sandwiches I’ve had. The pork and ham were moist. The bread firm and crusty, but with a fluffy middle. Tangy pickles and mustard, and just the right amount of toast and compression that a well-toasted Cuban sandwich should have. I also enjoyed people-watching here, since one couple had never had Cuban food before, and asked the waiter for all sorts of recommendations. They were obviously delighted with their first Cuban food experience, since by the end of their meal they were feeding each other their entrees and smiling. Overall, a good Cuban place with a good Cuban sandwich. Terrible and disrespectful service, while we had breakfast a”manager” called Janeth was continuously spitting in the buspens in front of us; when requested she yelled “I am the manager” and turned around, no wonder Us, the locals, have turned to cleaner and better places as Las olas or David’s Cafe in South Beach. We miss the old staff!! !